Native Americans. Other Winter Solstice web sites. INCA RELIGION: The ancient Incas celebrated a festival if Inti Raymi at the time of the Winter Solstice. Since the Inca Empire was mainly south of the equator, the festival was held in June. It celebrates "the Festival of the Sun where the god of the Sun, Wiracocha, is honored." 3 Ceremonies were banned by the Roman Catholic conquistadors in 1572 as part of their forced conversions of the Inca people to Christianity. A local group of Quecia Indians in Cusco, Peru revived the festival in 1944. It is now a major festival which begins in Cusco and proceeds to an ancient amphitheater a few miles away. JUDAISM: Jews celebrate an 8 day festival of Hanukkah, (a.k.a. Feast of Lights, Festival of lights, Feast of Dedication, Chanukah, Chanukkah, Hanukah). It recalls the war fought by the Maccabees in the cause of religious freedom. Antiochus, the king of Syria, conquered Judea in the 2nd century BCE. He terminated worship in the Temple and stole the sacred lamp, the menorah, from before the altar. At the time of the solstice, they rededicated the Temple to a Pagan deity. Judah the Maccabee lead a band of rebels, and succeeding in retaking Jerusalem. They restored the temple and lit the menorah. It was exactly three years after the flame had been extinguished -- at the time of the Pagan rite. Although they had found only sufficient consecrated oil to last for 24 hours, the flames burned steadily for eight days. Modern-day Jews celebrate Hanukkah by lighting one candle for each of the eight days of the festival. Once a minor festival, it has been growing in importance in recent years, perhaps because of the popularity of Christmas. NATIVE AMERICAN SPIRITUALITY: Many Native American communities hold religious or community events at the time of the solstice. There are countless stone and wooden structures that were created by Native Americans in the past to detect the solstices and equinoxes. 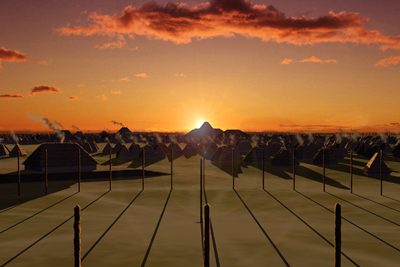 Today, it is called "Woodhenge" and consists five separate timber circles, one of which is shown above in an artist's reconstruction by Herb Roe. Each circle consists of many vertical wooden posts. The posts were of red cedar, which is considered sacred by many Native American groups. At sunrise on the Winter Solstice, two of the posts; the remains of a nearby mound; and the Sun; formed a straight line. The mound was once a temple built on top of an earthen pyramid with a flat top.The same observation occurs at the time of the Summer Solstice with a different temple and pyramid. A. Hirschfelder & P. Molin, "The encyclopedia of Native American religions," Facts on File, (1992). J.W. Mavor & B.E. Dix, "Manitou: The sacred landscape of New England's Native Civilization." Inner Traditions (1989).